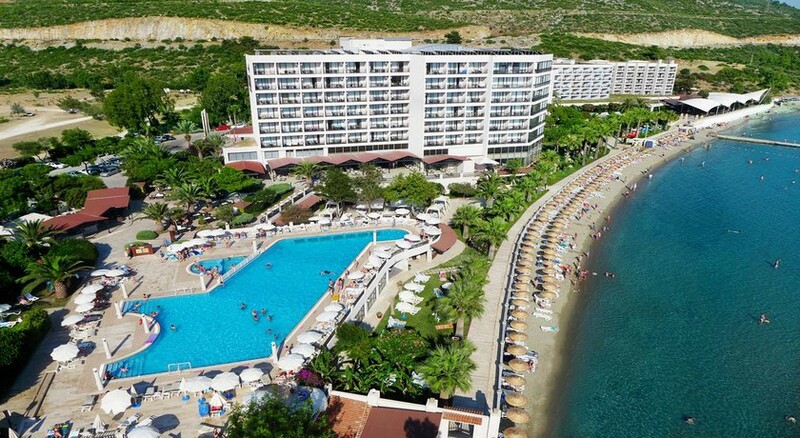 As the name suggests, the Tusan Beach Resort is ideally situated on the beach, with an amazing setting that ensures guests have a memorable holiday in the sunshine. 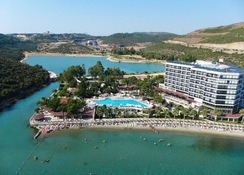 With the crystal-clear waters and golden sands just paces away, guests can enjoy all that this hotel has to offer. 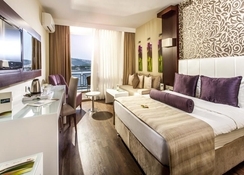 This stylish, spacious hotel set in Kusadasi, Turkey, ensures guests are taken care of from the moment they arrive and all rooms ensure that guests have a comfortable stay. When it comes to dining, guests have a choice of a buffet restaurant as well as a la carte restaurants and plenty of bars. Activities take place throughout the day for adults and kids while there are many attractions located just a short distance from the Tusan Beach Resort to keep guests entertained. The natural beauty that surrounds this wonderful hotel ensures that guests can make the most of all that it has to offer. Explore the beaches and water sports and head into the resort centre where there are many restaurants, bars and shops to choose from. Nearby there are aqua parks, more beaches and a lively atmosphere with nightclubs that can be accessed well into the night. The hotel is 60km from the airport. The hotel consists of Standard Rooms, Luxury Rooms and Family Rooms which are designed to give guests a comfortable and pleasant stay. Each room is tastefully designed with bright décor, space and great views. All rooms come with a range of features including air conditioning, cable TV, minibar, private bathroom with a hairdryer, safety deposit box and a balcony. The Tusan Beach Resort ensures that guests have all that they need when it comes to dining. 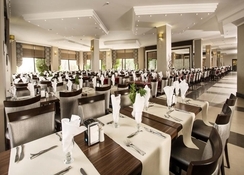 There is an on-site buffet restaurant that is perfect for breakfast, lunch and dinner but if that is not enough then there are two a la carte restaurants to choose from that serve up a choice of Mediterranean and Turkish dishes. During the morning and afternoon, guests can enjoy a range of snacks and beverages from the cafe and bar. If guests want to mix things up then they can take a stroll into the resort centre where they will find an array of affordable restaurants, bars and nightclubs. The hotel ensures that guests are taken care of when it comes to sports and entertainment. 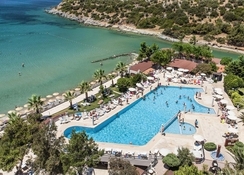 The outdoor pool is the perfect spot for a leisurely swim before enjoying the sunshine on the sun terrace while sport such as darts, volleyball, table tennis, basketball and tennis ensure all are kept busy. There is a kid's club and kid's aqua park as well as a gym and spa available for guests to make use of. There is plenty of entertainment on offer throughout the day with live music, sketches and shows on offer. Outside of the complex, guests can take a trip to the aqua parks, beaches and even explore some adrenaline-filled water sports. We had 3hrs delay in Bristol airport. And more than 2 hrs in bodrum. It was a terrible journey . Hotel food was same everyday. And no animations. Loutdy music by the pool.